There was a time when the family business was the cornerstone of America’s small business community. Having a business that could be passed from generation to generation in the same family was considered a way to preserve the family legacy into the fabric of the American dream. In the 18th and 19th centuries, before automation, the family business was a mark of pride. Children often worked in the business at an early age to learn the skills necessary to run the operation someday. A person starting a family business did so with the intention of having it last beyond their own years. There are still Americans who own a family business, whether they be the first in the family to start it or they inherited the business from a parent. Some of those businesses even maintain a level of precision in the products they make, and maintain a commitment to hard work that was the bulwark of the storied vision of the family business from years gone by. There are more modern versions of the family business as well. They are businesses supported by automation, but they often carry the family name and a tradition remains that someone from the next generation will run and control the business when the parents are unable to do so. But the idea of passing a family business from one generation to the next is no longer the anchor of American business ownership. Spectrem’s study of American business owners tells a different story. Serving Business Owners examines the attitudes and concerns of today’s owners of businesses both large and small. It details how they operate, what types of financial advisors and providers they use, how today’s medical insurance and social media worlds affect them, and what they plan for the future of their business. This is a huge topic for advisors to discuss with clients who own their own business. Will they need assistance in terms of a transfer of ownership, or will they need investment advice related to the anticipated income which will come when they sell the business to an outside person or firm? The sooner advisors know which direction the business owner plans to take, the sooner planning can begin. According to the study, only 25 percent of business owners said they planned to pass the business on to their family. 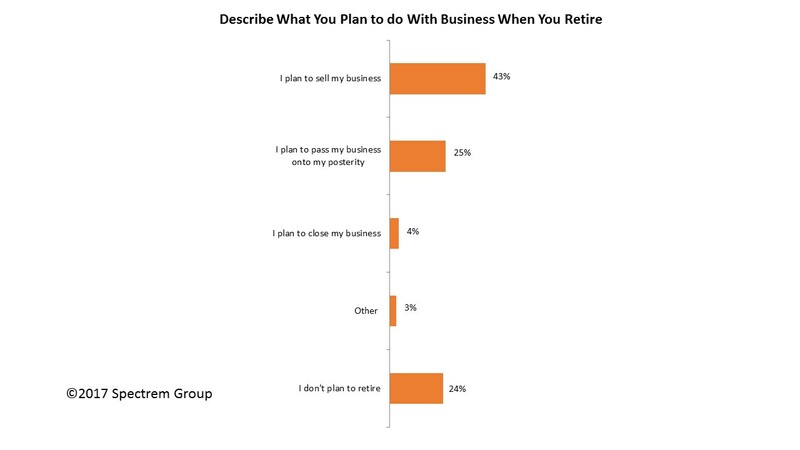 Older business owners, those over the age of 61, were slightly more likely to want to pass the company onto family. A more likely response was the plan to sell the business, the response shared by 43 percent of business owners. Advisors also must be aware that almost one-quarter of all business owners have no intention of selling their business or passing it along to family members (including more than 40 percent of female business owners). They apparently plan to stay in the job until they can no longer function, with no plans to retire from the working world. Business succession is not a topic for young business owners. Very few of them have given it any thought, as they are still trying to build their business and create new successes. But at some point there is a signal, either from age or from a business standpoint, that owners realize there will be a day when someone else will need to take over. At that point, they will need to speak to an attorney, their accountant and eventually their financial advisor to discuss financial plans. It is possible that the financial advisor can be the one who brings up the topic of business succession with an eye toward what the proceeds of a sale might be able to do as investment assets. The topic of passing the business along to family depends on the status of the family relationships and age and career path of children. Advisors working with a business owner need to know whether the client’s children or grandchildren have plans that do not include the family business. Any details can help the business owner plan for a successful transfer or sale of the business.